One of the most majestic achievements in the history of cinema, Lawrence Of Arabia is a captivating historical epic. David Lean brings to life with artistic grandeur the true story of T.E. Lawrence temporarily uniting the Arab tribes to open a new World War I front, creating a multi-sensory feast in the desert. In Egypt during the First World War, Lawrence (Peter O'Toole) is a nonconformist British Army Lieutenant with a uncanny understanding of the local culture. With Arabian tribes loyal to Prince Faisal (Alec Guinness) conducting low-level raids against Turkish outposts, Lawrence is reassigned to explore opportunities to coordinate and further exploit the rear flank of the Ottoman Empire. Quickly learning the ways of the desert, Lawrence teams up with Sherif Ali (Omar Sharif), a trusted Faisal ally, and after an arduous trek across the desert, unites Faisal's faction with the tribe of grizzled warrior Auda Abu Tayi (Anthony Quinn). In addition to his leadership qualities, Lawrence discovers with some anguish the uncontrollable euphoric rush that is triggered when he kills a man. Lawrence plots an audacious attack on the town of Aqaba, leading the united tribes as they rout the Turkish defenders, providing the Arabs with a resupply port and the British an incentive to pour more resources into the emerging militaristic wave of Arab nationalism. Lawrence is tasked with leading a campaign of supply route disruption against the Ottomans, consisting of punishing raids against the rail infrastructure. With his growing reputation beginning to attract international attention thanks to American reporter Jackson Bentley (Arthur Kennedy), Lawrence's worrisome tendency to believe in his own invincibility is punctured after a vicious encounter with a Turkish prison master (Jose Ferrer). With blood lust overcoming self-doubt, Lawrence leads the Arab tribes as they massacre retreating Turkish troops. A final push into Damascus is barely coordinated with the British Army, and Lawrence discovers that tribal unity in the desert does not translate into the ability to govern, and the promises of war will always yield to the realities of politics. Lawrence Of Arabia is 3 hours and 40 minutes long, but Lean's exquisite pacing ensures an immersive experience. The film is remarkably engaging, and incredibly, creates a thirst for more. As Lawrence's adventure in Arabia draws to a close, Lean evokes a sadness that an episode of remarkable military adventurism is coming to the end, and the story of one man making a lasting dent in the tide of history should and could on for longer. A large amount of praise should be reserved for Peter O'Toole. In his breakthrough role at 30 years old, O'Toole gives a performance as searing as the incessant desert heat, bringing Lawrence to life with a combination of British haughtiness and clever deference to the Arab culture. Making full use of the sharp screenplay by Robert Bolt and Michael Wilson, O'Toole keeps Lawrence intriguingly human by emphasizing his ever shifting focus, an uneasy mix of loyalty to Britain, infatuation with the desert and its people, and a self-serving quest for glory. 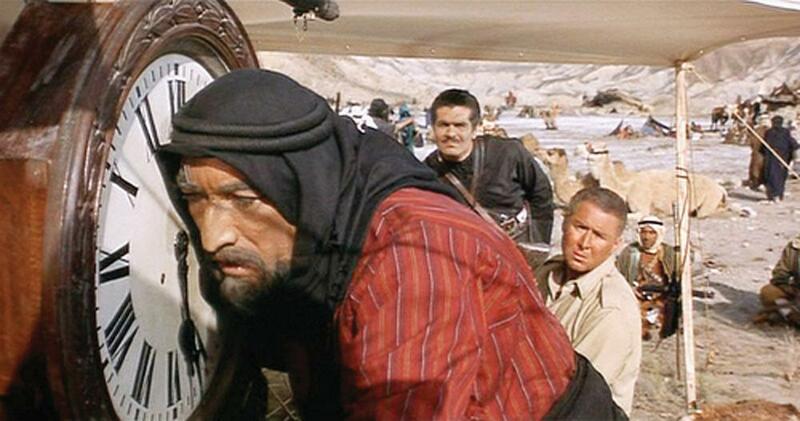 Omar Sharif, Alec Guinness and Anthony Quinn create a ring of sturdy desert wisdom around O'Toole. Sharif is the most textured, his Sherif Ali never yielding pride to Lawrence but allowing friendship and mutual respect to flourish after the roughest of initial introductions. Guinness and Quinn are more unidimensional at opposite ends of the scale. Guinness allows Faisal to lead from the back while waiting for the messy business of war to give way to the avaricious game of politics, while Quinn portrays Auda as blood thirsty and treasure hungry, an old fashioned war leader charging from the front with sword held high. Lean makes good use of other war movie stalwarts to round out the cast. Jack Hawkins is an animated General Allenby, leading the British forces in the Middle East and recognizing the need to channel and unleash Lawrence's erratic passion in the right direction. Anthony Quayle portrays Colonel Harry Brighton and represents the more traditional, less unpredictable elements of the British military, assisting Lawrence when he can but generally busy with the fussiness of regulations. And Claude Rains is Mr. Dryden, the shadowy political manipulator, directing events without getting directly involved, forecasting the endgame and planning accordingly while all around him are busy with the minutia of a still raging military conflict. 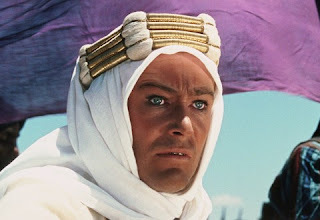 Cinematographer Freddy Young captures the vast desert as a living organism, Lawrence Of Arabia setting an unassailable standard for capturing the beauty and brutality of the ever shifting sands baking under the omnipresent sun. Lean and Young construct most of the movie out of a series of breathtaking tableaux, painstakingly constructed to maximize the impact of light and shadows, and human forms dwarfed by an immense hostile environment. Lawrence Of Arabia is also an ode to the camel, many scenes making use of hundreds of them, the animal proving to be remarkably graceful in its natural environment, and an essential means of travel, survival and warfare. Maurice Jarre's music score is one of the most famous and eloquent musical compositions created for a film. A spine tingling epic of ceremonial magnificence, the music unmistakeably evokes the wide open spaces of the dangerous desert nevertheless nurturing a defiant human spirit. Lawrence Of Arabia is a timeless classic, easily within the ranks of cinema's all-time most outstanding artistic achievements.